The introduction of 400W Double Ended (DE) lamps has created quite a buzz in the reef hobby with great expectations of improved light output and potential for better light solutions through new reflectors and the benefits of a smaller lamp size. Currently there are 2 sets of lamps being offered in the market (and potentially more to be introduced) the Avalon 400W DE series of lamps by Happyreefing.com and Icecap 400W DE lamps. The Avalon lamps are available in 10000K, 14000K, and 20000K flavors, and the Icecap in 10000K and 20000K. Each of these companies has their own luminaire for these lamps (Tests on these are currently underway and will be available in a future article). Interestingly, there is no current standard for these lamps. While they are designed to fit into a FC2 Double ended lamp socket (the same sockets used for 250W DE lamps) the lamps from these 2 different suppliers are not the same length. 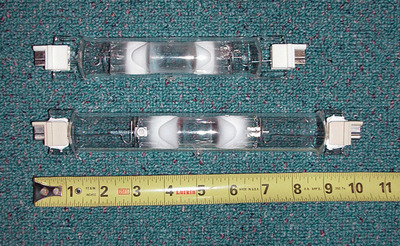 Figure 1 below show the lamps, the Icecap lamp is almost 2″ longer than the Avalon lamps. This will require the reflector systems to be adjustable to accommodate the varying lamp lengths. The trend here seems to be to design fixtures that are multi use with different settings for 250W DE, and 2 400W DE lamps. To further compound the confusion there is very little information available on the ballasts to drive these lamps. The only information I could gather was to the effect “We tried this ballast and it worked”. I tested these 400W lamp ballasts with all the different 400W ballasts I had laying around.Table 1 below show the various lamps and ballast combinations tested. While all the ballasts were able to fire the lamps, there was significant delay in firing when using some of the ballasts especially when starting a “cold” lamp (lamp that had not be fired in a while). The two “HQI” ballasts used were the PFO Lighting and a “HQI” ballast made in Taiwan (sold by All Seas). The Pulse start ballasts used was the Venture Pulse Start Ballast (ANSI-M135). 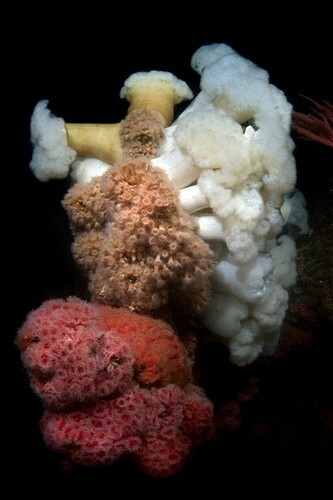 Three electronic 400W ballasts the Icecap, Reef Fanatic and Blueline were used since they were able to fire the lamps. The Icecap ballast is also a dimmable ballast and was tested at both setting 100% and 50%. For each lamp/ballast combination listed, data was collected on the spectrum, Photosynthetic Photon Flux Density (PPFD) or PAR, as well as data on the power consumption of the ballasts. The power consumption was determined using a Vector True RMS power meter into which the ballast was plugged. The Vector power meter also records the voltage and current. The test setup used was the same as all previous lamp tests [1-12], thus allowing for direct comparison of the results of these lamps with previously tested lamps. Since the DE lamps are designed to be used in a fixture with a glass shield for UV protection, the data was collected for both the shielded and unshielded situation using the same glass shield (take from a PFO lighting fixture) that was used in all the previous tests of 250W and 150W DE lamps. In this section we present the results of testing the different lamps using different ballasts. For each lamp tested different ballasts were used to fire the lamp and data is presented for the unshielded and shielded case. Spectral data is only provided for the shielded case since it is the recommended mode of operation for these lamps. 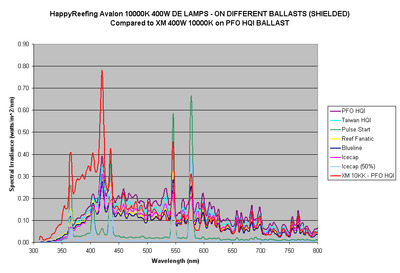 Figure 2: Spectral Plot of the Avalon 400W DE 10000K lamp on different ballasts. 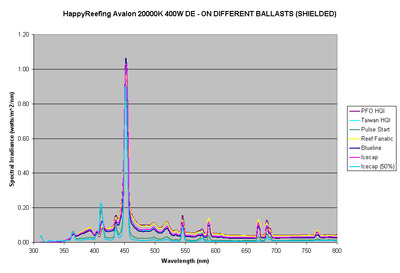 Figure 3: Spectral Plot of the Avalon 400W DE 20000K lamp on different ballasts. 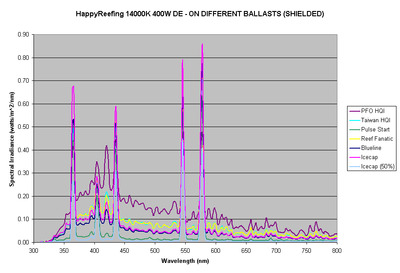 Figure 4: Spectral Plot of the Avalon 400W DE 14000K lamp on different ballasts. As seen from the above data there is wide variation in output with the different ballasts, along with a wide range of power consumption. This lamp also has higher output in the UV region with a strong peak at 366 nm. Figure 5: Spectral Plot of the Icecap 400W DE 10000K lamp on different ballasts. 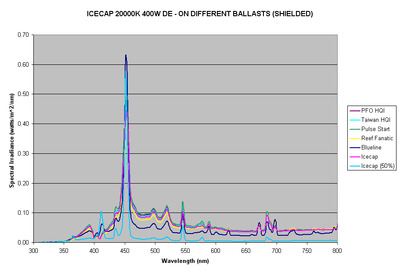 Figure 6: Spectral Plot of the Icecap 400W DE 20000K lamp on different ballasts. As seen from the data, the ICECAP 10000K and 20000K basically have very similar spectral performance, with the ICECAP 10000K producing more PPFD on all ballasts. The Venture pulse start ballast performed much better with these lamps than with the Avalon lamps. Figures 7 and 8 provide a comparison of the light output all the lamps, ballasts and power consumption. 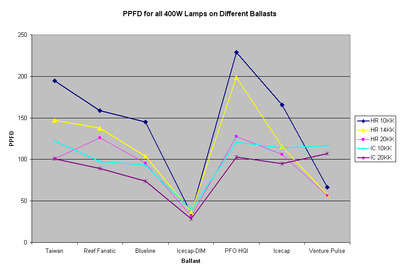 As seen from figure 7, the Avalon 400W DE lamp has the highest PPFD output on all ballasts. The Avalon lamps have a poor performance with the Venture pulse start ballast, but the Icecap lamps perform quite well on this ballast. The variation in output is much smaller for the Icecap lamps as compared to the Avalon lamps. The Blueline ballast draws the least power of all the ballasts tested. The ultimate question that pops up when evaluating these 400W DE lamps is – “Do the 400W DE lamps have more light output than the 400W single ended mogul lamps?”. To answer this question, the lamps are compared to the single ended lamps that are similar to these lamps in light output. In this case the 400W 10000K XM and 400W 20000K Radium single ended lamps running on a PFO HQI ballast were chosen. The 400W DE lamps also have highest output with this ballast. 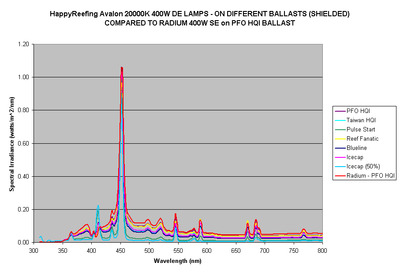 Figure 9, and 10 show the spectral comparison of the Avalon 400W DE lamps with the Radium lamp and XM on the PFO HQI ballast. As can be clearly seen (fig 9), the 400W 20000K DE lamp has a spectral output very similar to the Radium and does not have a higher PPFD than the Radium. When comparing the 400W DE to the XM single ended (fig 10) the XM has a spectral plot that is different from the Avalon 400W DE 10000K lamp – with a higher output in the 350-450 nm range and lower in the other wavelengths. The PPFD value of the XM is 202 compared to the 229 for the double ended lamp. The highest PPFD values obtained for the XM lamp was 224 with the Taiwan HQI ballast. 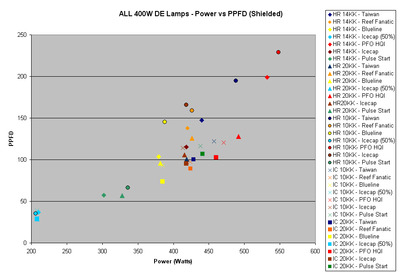 Comparisons with other 400W and 250W lamps can be made by comparing the data on other lamps in my previous articles [1-12]. While these lamps offer an interesting alternative to the reef hobbyist, they are not categorically a whole lot better than the single ended options currently available. Whether the reflectors make a big difference in the light output remains to be seen, and will be the subject of a future article. These results and tests are based on a single lamp and currently we have no idea of the variation in output. Consequently small differences less than 10% may be insignificant. Further these are all new lamps with a 100 hr burn in time, there is no data available on the longevity and durability of these lamps. I would like to thank several people whose help made this study possible. They were kind enough to provide lamps and ballasts for testing: Patrick at PFO Lighting, Andy at Icecap, Nguyen at Happyreefing.com, Reef Fanatics, Champion Lighting, and Len Ho for his Taiwan HQI ballast. Finally, we would like to thank Dr. Paul Walker of Penn State University for the use of the spectroradiometer. Joshi S., Spectral Analysis of 250W Mogul Base Lamps-Part II, Advanced Aquarist, August 2004.